"Bejiing +15: Perspectives of Rural Women"
It has been fifteen years since RDLN organized a group of forty-plus rural women to participate in the NGO Forum on Women in China. This year's meetings on the UN Commission on the Status of Women were organized around that fact, and RDLN presented a panel "Bejing + 15: Perspectives of Rural Women, focusing on changes since that time in the panelists' own geographical areas. (See papers above). RDLN also organized a Rural Caucus within the CSW framework and hosted its initial session on Friday, March 5. 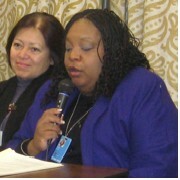 Peggy Kerry, CSW NGO Liaison from the United States Mission, attended the session. -Shirley McClain, RDLN’s Issues Coordinator, based in Holly Springs, North Carolina, who gave an overview of U.S. rural women with some additional information about those in North Carolina. - Michelle Cole, Director of Community Services for Cole Evangelistic Ministries in Aliceville, Alabama, who spoke about the increasing number of women prisoners and improved health testing for women in her area. -Yvonne Hampton of Butler, Alabama. Yvonne is Executive Director of the Choctaw County Community Development Center, President of the West Alabama Farmers Association, and a former staff member of the Federation of Southern Cooperatives Rural Education and Training Center in Epes. She spoke of the changes that have affected women farmers over the past fifteen years. 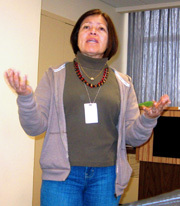 - Mily Treviño-Sauceda, President Emerita of Lideres Campesinas, a statewide women’s farmworkers organization in California, who spoke about the status of farmworker women. She is a member of RDLN’s Board of Directors. After the panlists spoke, Euneika Rogers-Sipp, who works with the Black Freedmen’s Living Historical Farm for Children in Furman, Alabama as well as the Alabama Sustianable Agriculture Network, facilitated the discussion session. In addition to those mentioned, Alina Diaz of the New York Legal Action Program joined the RDLN group She and Mily Trevino-Sauceda raised the issue of U.S. women farmworkers victimized by trafficking at the U.S. caucus, and during the RDLN sessions.